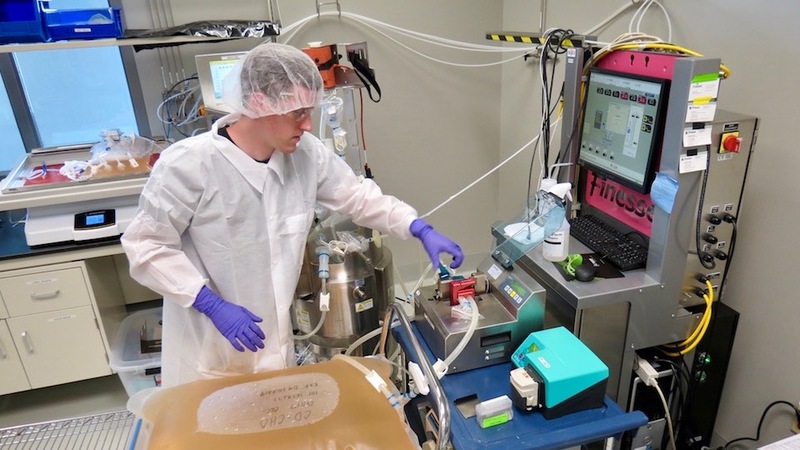 Bioprocess Training Associate operating one of BTEC's single-use bioreactor systems to culture animal cells. Principal investigators at North Carolina State University’s Golden LEAF Biomanufacturing Training and Education Center (BTEC) are leading two collaborative projects recently launched by The National Institute for Innovation in Manufacturing Biopharmaceuticals (NIIMBL). NIIMBL seeks to accelerate biopharmaceutical innovation, support the development of standards that enable more efficient and rapid manufacturing capabilities, and educate and train a world-leading biopharmaceutical manufacturing workforce, fundamentally advancing United States competitiveness in this industry. Dr. Gary Gilleskie, BTEC’s acting director, is leading the development of a scalable platform process for production, purification, and analysis of adeno-associated virus (AAV) vectors used in gene therapy. The platform process will be used to develop hands-on training courses and test new process and analytical technologies used for vector production. Rick Lawless, BTEC’s director of industry programs, is project lead for the implementation of automated bioprocess test beds at BTEC and two other universities. Each test bed will consist of process Sensors and software for Process control, Integration, Data analysis, process Evolution, and Reporting. The test beds in the SPIDER Network will be utilized for training in a variety of automation topics. Research teams can also use the test beds to facilitate innovation of new process analyzers, software, production processes, and data analysis models. BTEC is a unique, cross-disciplinary instructional center that provides educational and training opportunities to develop skilled professionals for the biomanufacturing industry and create the best-trained, most industry-focused workforce possible. It also performs bioprocess and analytical services using its facilities, equipment, and the expertise of its faculty and staff.